Women's Silver Snowdrop Pearl Necklace : LOVE2HAVE in the UK! 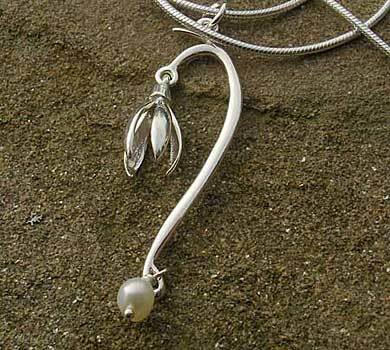 This women's silver necklace is another adaptation of the silver snowdrop pendant that matches the snowdrop range of jewellery. Again, it comes fashioned into a snowdrop, a flower that reminds us that Spring is on its way once we are through the Winter time. The fragile beauty of the tiny snowdrop marks the end of Winter and the new beginnings of Spring. 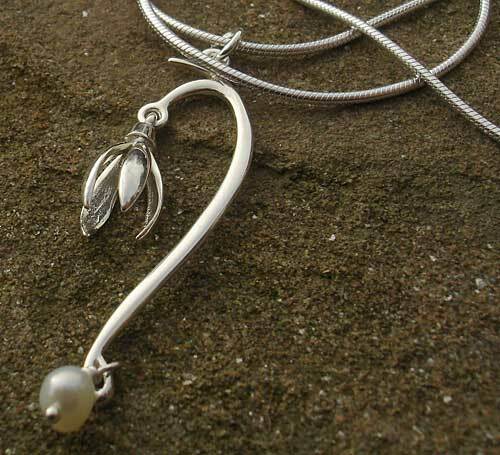 The design this time features a long curved silver piece that at its top features a dangling snowdrop and a white pearl at its other end. The total height measures approximately 45mm. 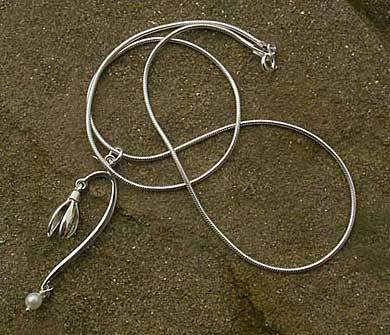 It comes on a 16-inch sterling silver chain with a lobster clasp and matching earrings are also available. This lovely, delicate collection is all made from sterling silver.